The Boynton House dates from circa 1875 and is recognized as a historic site designated under the Ontario Heritage Act. 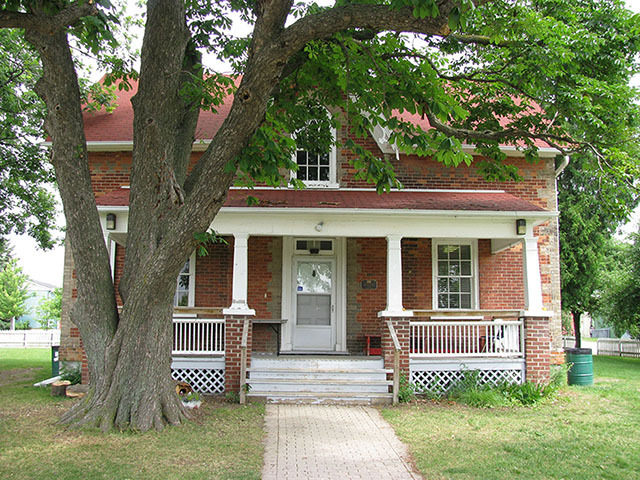 It’s a good example of a classic Ontario farmhouse, with a steep centre gable decorated with curvilinear bargeboards (gingerbread trim) and a gothic window with interlacing tracery. The exterior of the patterned brick house has been slightly altered since T.F. Boynton’s time, except for an Edwardian Classic Style veranda added by his son, Thomas Edward in the early 1900s. The Boynton farmhouse stands on its original site in the midst of the Richmond Green Park, and is a reminder of the site’s early history. Looking for the perfect space to host your art show? Need a temporary site to showcase your work? With four rooms that are suitable for display, Boynton House is the perfect location to host your next art exhibit. All four rooms on the main floor have been equipped with an art hanging system and new track lighting has been installed. It’s the ideal venue to showcase your work! The Richmond Hill Art Exhibition Space Rental Program was developed to provide artists access to properly equipped Town facilities and their surrounding grounds for self-generated art exhibits and shows. Information regarding site amenities, rental details, the application process and eligibility criteria can be found in the brochure at this link. For more information, contact the Town’s Art Supervisor at (905) 787-1441, ext. 222, email mzikovitz@richmondhill.ca, or visit the website.